... for more CASE Study fun! Our May muse, Wida Miller, has done it again with this pretty little number. 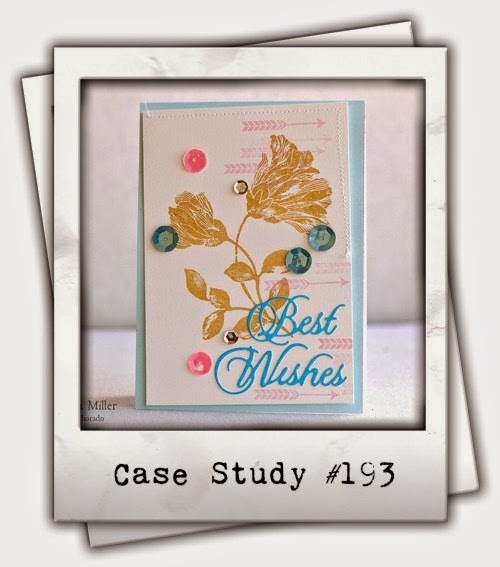 To create my card, I used Penny Black's Creative Die, 51-030 Field of Dreams, using the negative die cut as stencil through which I created a watercolor look using Faber-Castell Design Memory Craft Gelatos mixed with water and applied using a paintbrush. Next I stamped my arrows (Penny Black 30-248 Lost Without You and 30-226 Kind Words) using Ranger Archival ink in the color of Saffron. I die cut my sentiment (Penny Black 51-028 Celebrations) two times from watercolor paper, stacked and glued each one together, and then added to my card for an extra thick/dimensional look. Finally, I embellished the panel with sequins and pearls and mounted it onto my notecard using dimensional adhesive. Check out the links below to see what the CASE Study Design Team cooked up with Wida's inspiration, or visit CASE Study directly for the full reveal.